Every year hundreds of teenage drivers lose their lives in motor vehicle accidents. Statistics show that the leading cause of death for young people between the ages of 15 and 20 is motor vehicle accidents. Teen are responsible for 14% of all accident fatalities in this country. The majority of teenage fatalities are the result of excessive speed. Teens look forward to the day when they become licensed drivers. However, teaching teens to drive can be a parent's worst nightmare. If you are teaching your teen to drive, be patient, teach him good driving habits, which in turn will make him a good driver. Also be a good role model. If you curse at other drivers, make obscene gestures, run red and yellow lights or speed, you are teaching your teen to drive recklessly. Take your teen to the Department of Motor Vehicles and allow him to pick up a driver's handbook so he can learn the rules of the road. Review it yourself before taking your teen out for driving lessons. 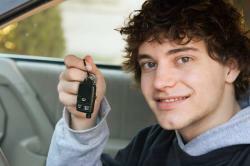 Make sure your teen studies the handbook and knows the rules of the road before allowing him to get behind the wheel. Phone your insurance company and ask if they have books and videos on safe driving. Also ask how your teen can qualify for new driver discounts. Ask for a quote and add you teen to your insurance policy. He must be insured before he gets behind the wheel of your car. Teens need to be aware that you just don't get into a vehicle and drive it. Here are a few safety tips to teach your teen that will keep him safe while driving. Adjust headrests so they are immediately behind the back of the head. This will protect the neck if he happens to be in an accident. There must be a seat belt for every person in the car and it must be properly attached before the car is put into drive. No seat belt and the car doesn't move. Keep the windshield and all windows clean for higher visibility. Ensure the vehicle's gas tank is always half full. This will prevent your teen from becoming stranded. Keep eyes on the road at all times. A split-second distraction can cause an accident. Drive defensively. You don't own the road, but you are responsible for the car. Country driving is very different than city driving. Give your teen these pointers for driving in the country. When driving on gravel roads, use caution. Loose gravel can cause a vehicle to skid. Never turn the steering wheel sharply when driving on gravel because it will cause you to loose control. Be alert for animals crossing the road, especially near farms. Livestock occasionally escapes their confines and may wander onto the road. Slow down when you see animal crossing signs. Deer may dart into the road and where there is one there are often more. Deer and moose can easily total a car when hit and they're most active between dusk and dawn. Never try to kill bees or insects while driving. Find a safe place to pull over and get the insect out of the car. Invariably at some time your teen will run into inclement driving conditions. He needs to know how to stay safe. When driving in fog, rain or sleet, use caution and slow down. Turn your headlights on every time you use your windshield wipers. White cars can be camouflaged in snow. Always run your headlights when traveling in winter. If you live in the northern hemisphere, always carry an ice scraper and a brush during the winter months. Keep windows clear of ice and snow for good visibility. If you become stuck in snow, clear your exhaust pipe to prevent carbon monoxide poisoning. Brake gently on icy, wet or snowy roads. Remember, bridge surfaces freeze before the road surface. Always keep your car's windshield washer reservoir full. This will prevent you from running out in dangerous conditions. If possible, do not travel in inclement weather conditions. Teens need experience before taking on roads that are slick with oil and rain or slippery because of winter driving conditions. Today, many teenagers drive to school. The following tips will ensure everyone's safety. Be alert for kids getting on and off school buses. Arrive at school ten minutes early to avoid heavy parking lot travel. By doing so your car will be parked before everyone else arrives. Never park in fire zones. Driving in heavy traffic is challenging for new teenage drivers. The following tips will keep them safe while driving in traffic congested areas. Never assume that a signal light means a car is turning. It may have been left on by mistake. Never turn left in heavy traffic unless there is a traffic light installed at the intersection. Instead, continue on your way until you find an intersection with a traffic light. Be alert for aggressive drivers. The majority of accidents are caused by those who think they own the road. Never pull out in front of another vehicle or cut them off changing lanes. This can cause them to slam on their brakes, which in turn can cause a chain reaction and a pile-up. Teenagers are ecstatic to gain freedom from their parents when they get their driver's license. The problem is that teens often don't realize that driving is a big responsibility. To keep your teen safe, draw up a driving contract that outlines the rules to be followed and the consequences if they are not. Be certain that your teen realizes that driving and a driver's license is a privilege and not a right. Specify the car your teen is allowed to drive. It should be equipped with an airbag. Your teen should be required to maintain the car he is driving for cleanliness inside and out, fluid levels, oil changes and other regular maintenance, including tire pressure. Paying extra insurance premiums if he has a part or full time job. Always driving sober and free of alcohol and all drugs, including prescription medications that can cause drowsiness. Always letting you know where he is going and when to expect him home. This includes letting you know if he is running late. No passengers in the car until he has been driving for at least one year. Passengers cause distractions and distractions cause accidents. A curfew that must be strictly adhere to. Any other rules that you wish to include in the driving contract. If your teen will not sign, he should not be allowed access to a car. The consequences if these rules are not kept. Follow through with consequences always, with no excuses allowed. Following these tips and teaching your teen driving responsibility will help keep him safe on the roads this summer.